GCM develops proprietary Digital Signal Processing (DSP) solutions for broadband communications and high speed wireline and wireless communication systems. 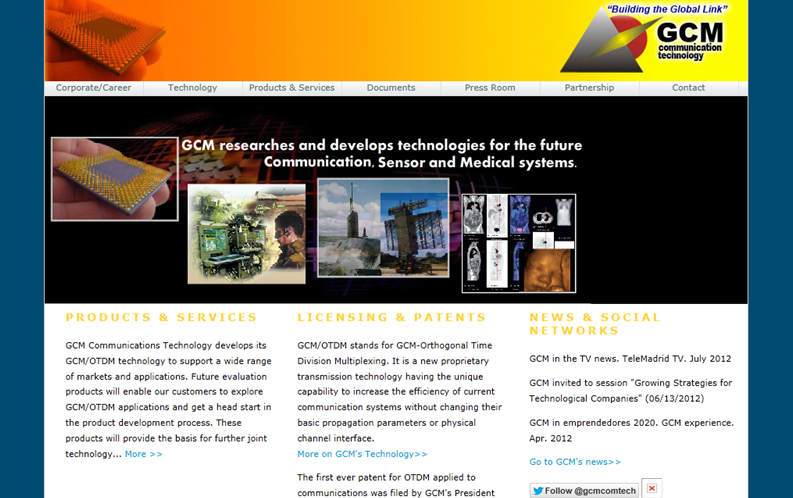 The company was founded in 2001 based on its unique and proprietary technology, OTDM. GCM's technology offers more capacity and broader reach for communications products based on cable and radio, which results in significant optimization of investment in infrastructure and consumption and is thus a key differentiator. To date, GCM has developed applications for a wide range of industries including satellite communications, radar, wireless and wireline broadband, medical imaging or oil prospecting, where OTDM technology notably increases the equipments sensitivity with respect to current systems. “Nauta leads €3,3M series A round at ChannelSight"
The online English platform ABA English has just closed its first funding round for $3.4 million with the venture firm Nauta Capital. Nauta Capital mobile gaming company Social Point has raised 30 M$. Highland Capital has led the round and existing investor Idinvest has also participated. “Nauta leads $2,2M round in Boston based Content Raven"
Copyright © Nauta Capital 2014. All rights reserved.